May is Whisky Month, and to celebrate we are running our whisky tour ‘Cask Is King’ every Thursday evening. We invited our expert whisky partner Skene Scotch Whisky to give us some insight in to the history of our national drink. It is not known exactly when distilling first arrived on these shores, but there are vague references to a drink that was ‘stronger than wine’ as far back as the sixth century. The first official record of distillation in Scotland was documented in the tax records in 1494. There is in fact a written reference to monks brewing ale in Holyrood Abbey in the 12th Century, and whisky is (in it basic form) distilled beer! Whisky was first distilled in monasteries, and used predominantly for medicinal purposes. 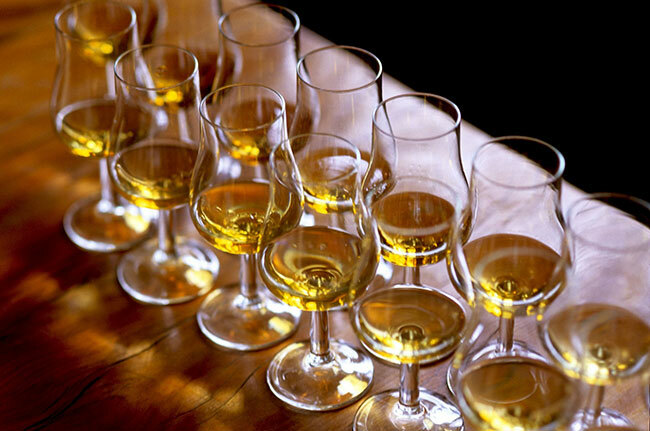 In fact the word ‘whisky’ is thought to come from the Gaelic ‘uisge beatha’, or ‘usquebaugh’, meaning ‘water of life’. In 1505, the Guild of Surgeon Barbers in Edinburgh was granted the monopoly over the manufacture of ‘aqua vitae’ with the first law regarding the provision of aqua vitae passed in 1548. This kicked off a legal battle over whisky that lasted for over two hundred years. During the 16th century, the monasteries were destroyed and the monks fled to the Highlands of Scotland, which had the perfect climate and location for producing whisky. Distilling quickly became widespread throughout the community as the main crops were barley and oats and the Highland Glens kept them hidden from the taxman. For many years the government chased the distillers to no avail until they decided to pass the Excise Act in 1823, allowing distillers to purchase a licence to produce whisky. Glenlivet distillery was the first to sign up in 1824 and many more followed, thus revealing their secret locations. Up until the 19th Century, the majority of distilled spirit was drunk direct from the still! Casks or barrels have been used in Scotland for the transportation of goods for centuries and whisky was no different. From the “Porters Stone” (dated 1678) we know casks & barrels were arriving in and being traded in Leith and casks filled with the wines of Jerez that were shipped into Scotland. It became apparent that the spirit benefited from storage in these casks with the sweet flavours from the wood being imparted into the spirit and the aging in casks is one of the most important components in quality aged Scotch whisky. Cask Is King tours are taking place at The Real Mary King’s Close every Thursday in May at 9.15pm, advance booking is highly recommended. Tickets are priced at £35 per ticket and can be purchased online, by phone on 0131 225 0672 or in person at The Real Mary King’s Close. ©The Real Mary King's Close. All Rights Reserved.